Four Sliders served on freshly baked rolls, tossed in BBQ sauce and served with Hay Bale onion rings. Two Sliders served on freshly baked rolls, tossed in BBQ sauce and served with Hay Bale onion rings. Tender pieces of boneless fried chicken breast. 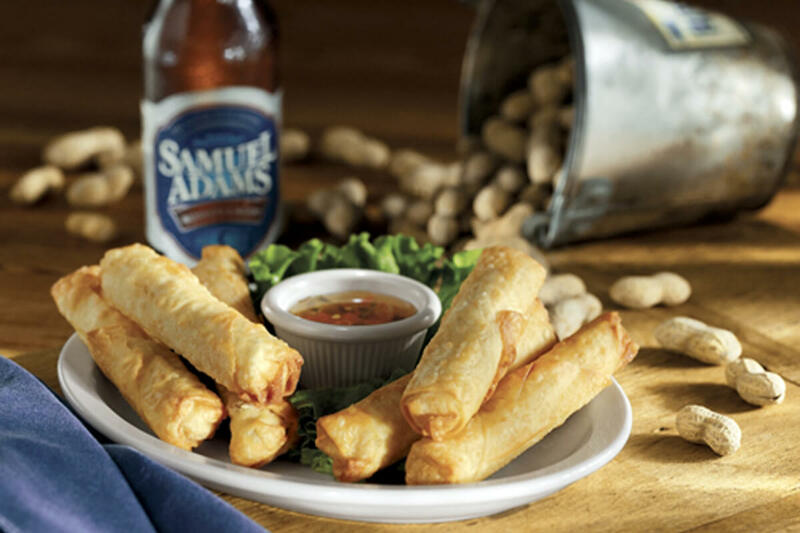 Served with celery sticks and bleu cheese dip. Choose Bourbon, Original BBQ, Honey Molasses BBQ or Spicy Hot. Potato lovers, there’s nothin’ better. Shredded chicken covered with two kinds of cheese and slathered with BBQ sauce. Potato lovers, there’s nothin’ better.. Bacon covered with two kinds of cheese and slathered with BBQ sauce. Hearty chicken wings, piping hot and tasty! Choose Bourbon, Original BBQ, Honey Molasses BBQ or Spicy Hot. Served with celery sticks and bleu cheese dip. Served by the pound. *Consuming raw or undercooked meats, poultry, seafood, shellfish or eggs may increase your risk of foodborne illness, especially if you have certain medical conditions.• **Recommended original roadhouse signature items. Roadhouse Broil* ** 9 Oz. Peppercorn New York* ** 12 Oz. Bacon Wrapped Filet Mignon* 6 Oz. Bacon Wrapped Filet Mignon* 8 Oz. Jim Beam® Ribeye* ** 18 Oz. 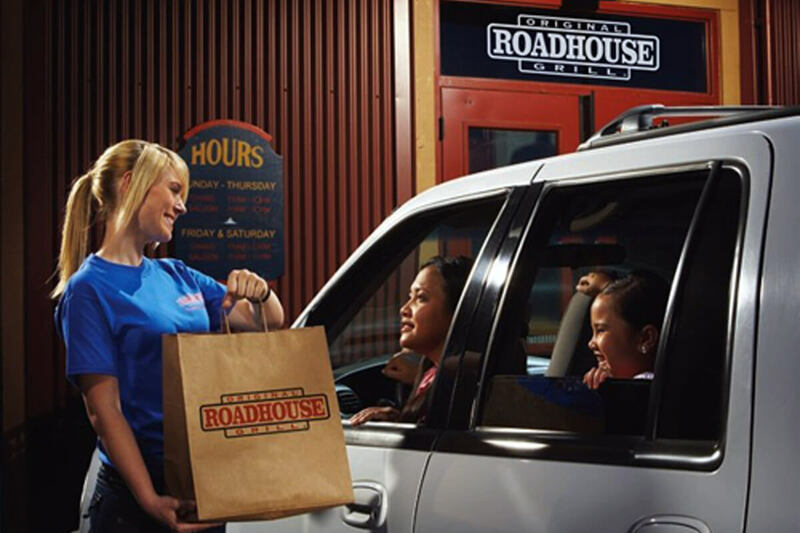 A succulent stack of pure joy, served Original Roadhouse style. Full half BBQ chicken slow roasted and mesquite-grilled with our Original Roadhouse Grill BBQ sauce. 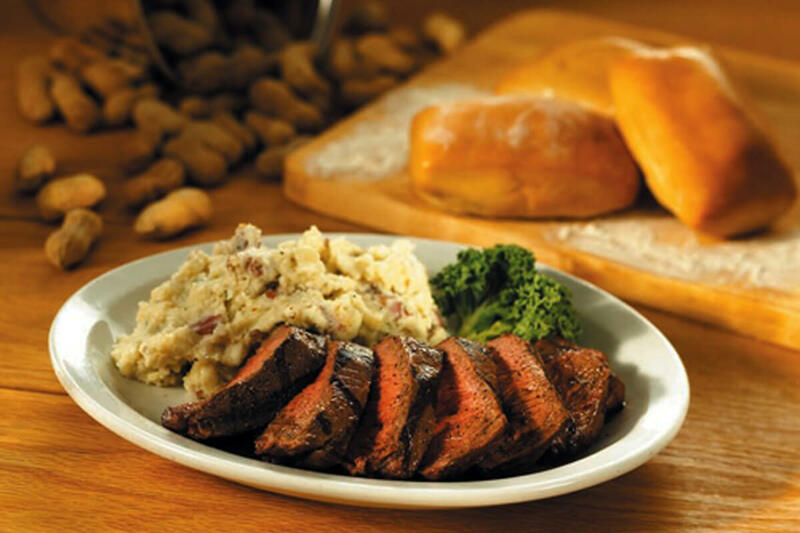 Original Bourbon Tri-Tip* ** 10 Oz. All entrees come with your choice of any 2 sides and freshly baked rolls with honey butter. Add any Dinner Salad, Soup or Chili to your meal for $2.49 each. A tender, all-natural chicken and served on a bed of rice. Boneless chicken breast, grilled with Parmesan Peppercorn. Served on a bed of rice. Boneless chicken breast, grilled with Honey Molasses BBQ sauce. Served on a bed of rice. All entrees come with your choice of any 1 SIDE and freshly baked rolls with honey butter. 6 Oz. fresh Midwestern beef hand-cut daily in-house. Original Roadhouse twist on a classic. A 6 Oz. tender choice steak, marinated in a blend of red wine, soy sauce, garlic and other seasonings, grilled to your liking and thinly sliced. A hearty 8 Oz. steak marinated in our Bourbon glaze, slow roasted overnight to tender perfection and basted with our Original BBQ sauce. Served medium, medium-well and well-done. 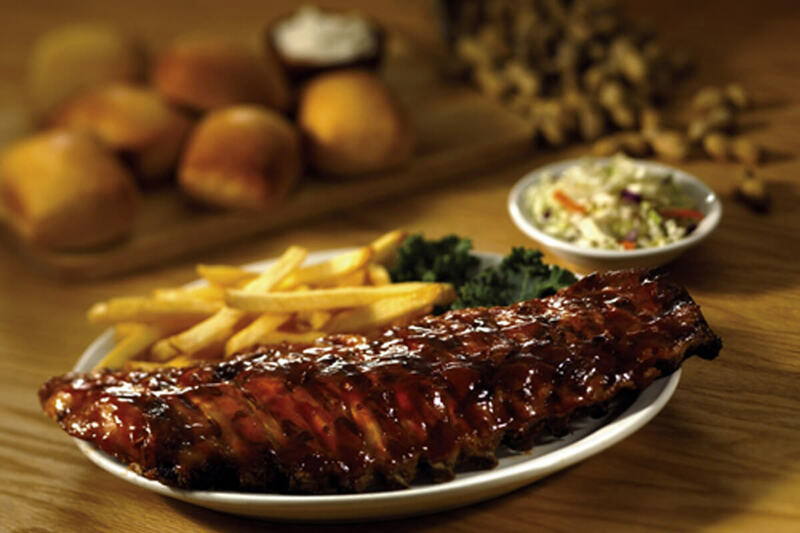 A 1/4 BBQ chicken, slow roasted and mesquite grilled and our tender, meaty St. Louis Ribs. A tender 7 Oz. boneless pork chop grilled with our own special seasoning and served with cinnamon apples. A tender, all natural boneless chicken breast, grilled and topped with a decadent blend of three cheeses, jalapenos, artichokes, chopped onions, cream and cognac. Served on a bed of rice. A tender, all natural chicken breast, grilled with your choice of Cajun seasoning or Parmesan Peppercorn, Original BBQ or Honey Molasses BBQ sauce. Served on a bed of rice. US farm raised catfish, mesquite grilled and served with your choice of Cajun or Roadhouse Seasonings. 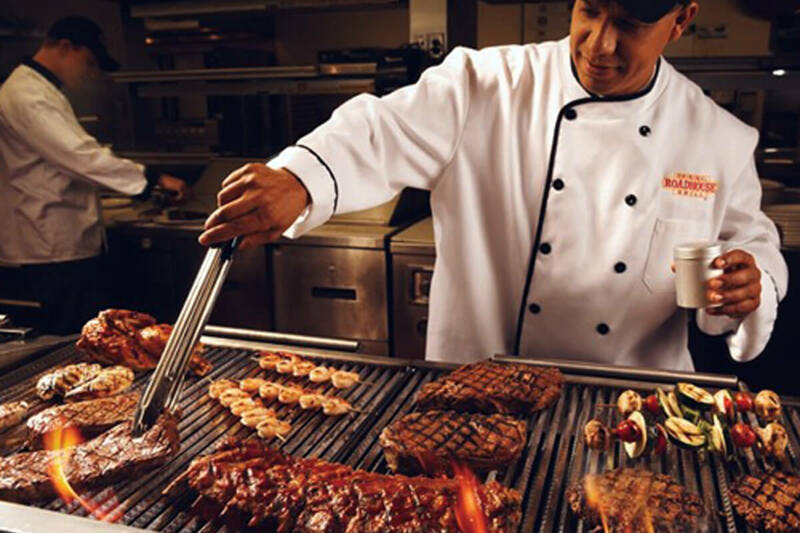 Grilled how you want it. Burgers come with crisp lettuce, fresh tomato, pickles & red onions on your choice of a toasted whole wheat bun, potato bun or ciabatta roll. Served with fries. Served with your choice of one freshly made side. Tender pork roast, slow roasted and hand shredded, tossed with Carolina style marinade and Roadhouse BBQ sauce, topped with our house made cole slaw. Served on a brioche bun. A tender, all natural chicken breast, grilled with BBQ sauce. A tender, all natural chicken breast, grilled with Honey Molasses BBQ sauce. A tender, all natural chicken breast, grilled with Peppercorn Parmesan sauce. Boneless chicken breast dusted with Cajun seasonings and topped with pepper jack cheese. Served with chipotle mayonnaise on a brioche bun. Traditional and signature brown sugar pepper crispy bacon piled high and topped with crisp lettuce, fresh tomato and mayonnaise. Served on toasted sourdough. Roasted turkey breast sliced thinly and piled high. Topped with crispy bacon, mild cheddar cheese, jack cheese, crisp lettuce, fresh tomato, pickles, onion and mayonnaise. Served on toasted sourdough. Boneless chicken breast, fresh spinach leaves, sliced tomatoes and smashed avocado. Served with Roadhouse Aioli on a brioche bun. Tender 8 Oz. steak topped with grilled onions. Served with Roadhouse Aioli on a French roll and a side of Au Jus. Salad Dressings: Choose from Bleu Cheese, 1000 Island, Honey Mustard, Lemon Dill, Italian,• Ranch, BBQ Ranch, Peppercorn Parmesan, Pomegranate Vinaigrette,• Fat-Free Sundried Tomato Basil Vinaigrette or Roasted Garlic Balsamic Vinaigrette.• All salads come with freshly baked roll with honey butter. Mixed greens, tomatoes, jack and cheddar cheeses, bacon, red onions, hard-boiled eggs with mesquite-grilled chicken. Mixed greens, tomatoes, jack and cheddar cheeses, bacon, red onions, hard-boiled eggs with grilled shrimp skewers. Mixed greens, tomatoes, jack and cheddar cheeses, bacon, red onions, hard-boiled eggs with sliced sirloin steak. Mixed greens, tomatoes, jack and cheddar cheeses, bacon, red onions, hard-boiled eggs with grilled salmon. Served with croutons. Anchovies on request. Topped with mesquite-grilled chicken. Served with croutons. Anchovies on request. Topped with grilled shrimp skewers. Served with croutons. Anchovies on request. 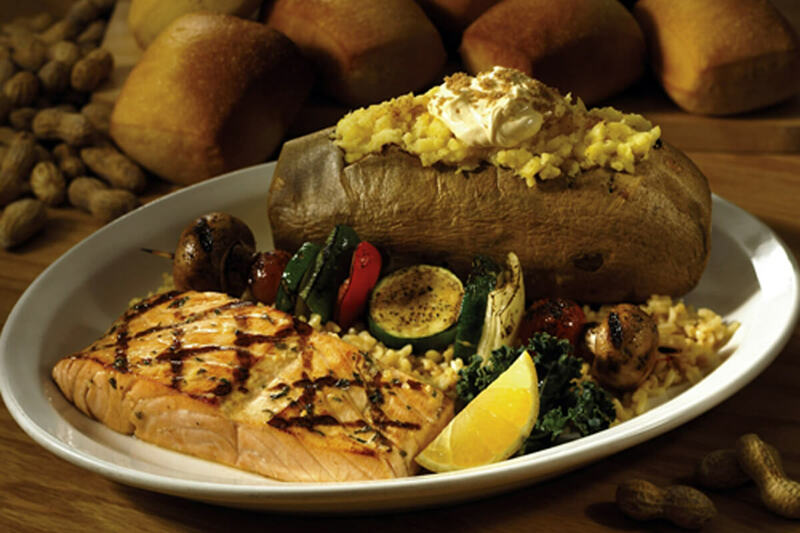 Topped with mesquite-grilled salmon. Tender pieces of white meat chicken breast on chopped romaine with mandarin oranges, sliced avocado, cherry tomatoes, sliced cucumber and bleu cheese crumbles. Recommended dressing – pomegranate vinaigrette. A bed of crisp romaine festooned with artichoke hearts, black olives, crumbled feta cheese, sliced cucumber and cherry tomatoes. Served with our homemade lemon dill dressing. Baby Spinach, sliced mushrooms, cherry tomatoes, hard-boiled egg, red onion, crumbled bleu cheese, dried cranberries, Roadhouse brown sugar pepper bacon and toasted hazelnuts. Served with a choice of Fries, Steamed Broccoli, Apple Sauce, Mandarin Oranges, Kids Side Salad or Garlic Mashers.• Substitute Sweet Potato or Baked Potato for $1.00. Messy, but oh so good. Vanilla ice cream drenched with hot fudge and caramel sauce, topped with whipped cream, chopped peanuts and cherries. Warm, homemade brownie topped with ice cream, hot fudge, chopped nuts, whipped cream and a cherry. Topped with your choice of strawberry, chocolate or caramel sauce. Studded with raisins, walnuts and pineapple and finished with cream cheese icing.